Proof of claim form enables the creditors to obtain the claim amount from the debtors by providing relevant proof. Individuals can use these forms to apply for claims during accidents with the insurance companies and obtain settlement amount quite easily. During handling bankruptcy situation companies can make use of these forms to complete selling or liquidating process smoothly. One can make amendments to the proof of claim as well. To get more knowledge about these forms one can search Google using Proof of Claim Form. 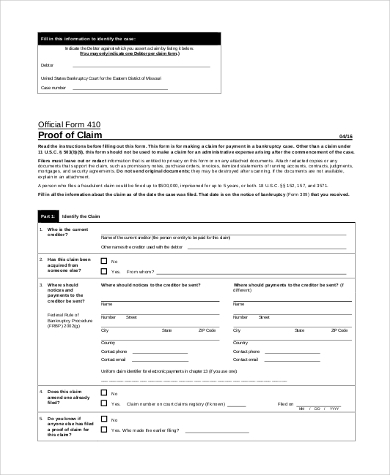 You may also see Health Care Claim Forms. 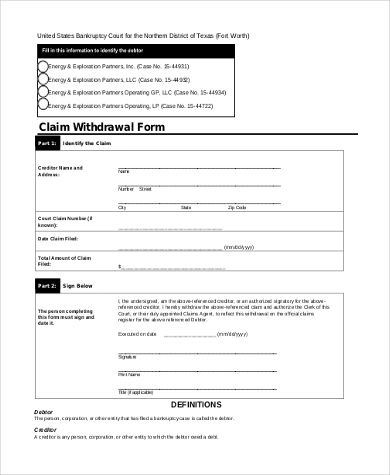 This proof of claim withdrawal form presents the creditor name and address, court claim number, a claim filed date and claim amount. It also obtains the signature of the creditor or authorized signatory of the creditor. 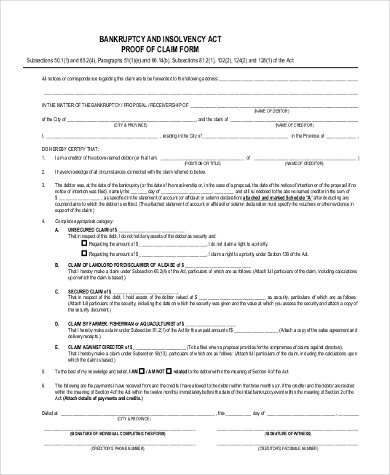 This amended proof of claim form presents the claimant name and address, telephone number, email id as well as claim information like type of claim and claim amount. The signatures of the claimant, witness, and notary public are obtained. You may also see Travel Claim Forms. This administrative proof of claim form presents the name and address of the creditor, payment address, the amount of claim details, government claim and other charges, the basis for the administrative claim and last four digits of debtor identification number. This proof of claim form presents the name of the current creditor, claim acquired details, the address for sending notices and payments, court claim number in case of an amendment, debtor identification number, claim amount and claim basis details. You can also see Disability Claim Forms. 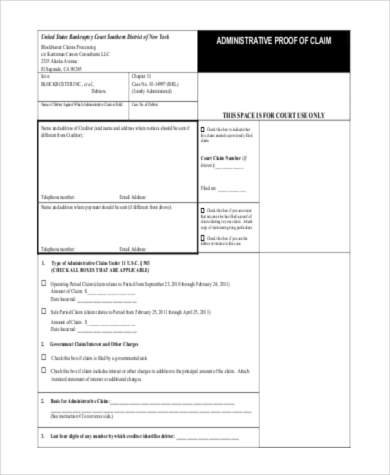 This bankruptcy proof of claim form presents the claim correspondence address, debtor name and address, creditor name, position and address, date of bankruptcy, total amount and claim details. It also obtains the signature of the creditor and the witness. 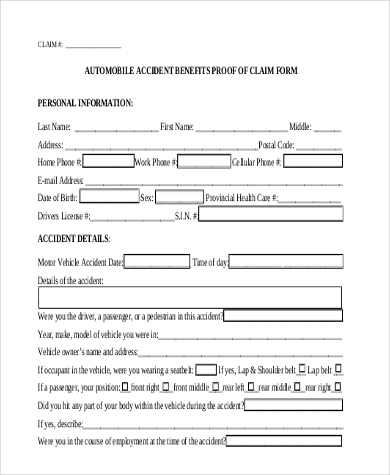 This automobile accident benefits proof of claim form presents the claimant name, address, phone number, email id, date of birth, driver license number and SIN number. It also records the accident details like vehicle accident date, time and description of the accident as well as injury details. You may also see Medical Claim Forms. This creditor proof of claim form presents the name of the individual, title and address, telephone number, email id, claim amount, receivership entity, specific grounds for claim and claim status. It also obtains the signature from the individual. 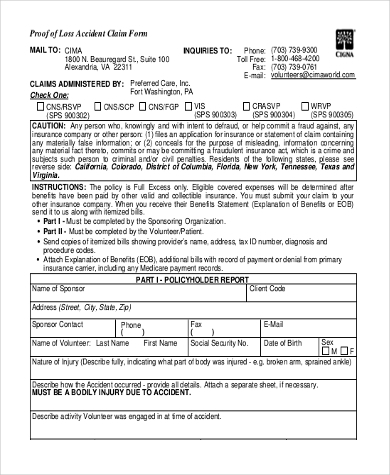 This proof of loss accident claim form presents the name of the sponsor, client code, address, phone number, email id, injury details and volunteer details like name, date of birth, SSN and activity engaged during the accident. It also records accident details like date, place and time of the accident. You can also see Travel Expense Claim Forms. 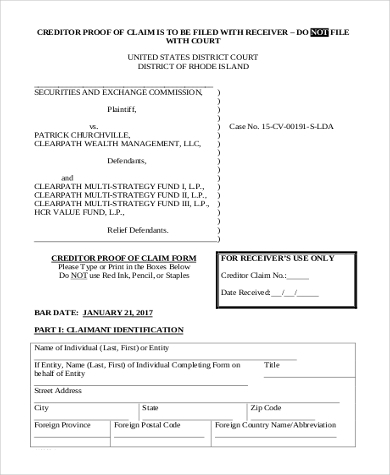 This proof of claim and release form presents the claimant name and mailing address, telephone number, email id, purchases or acquisitions details, sales details, details of holdings and claim execution date. It also obtains the signature from the claimant. 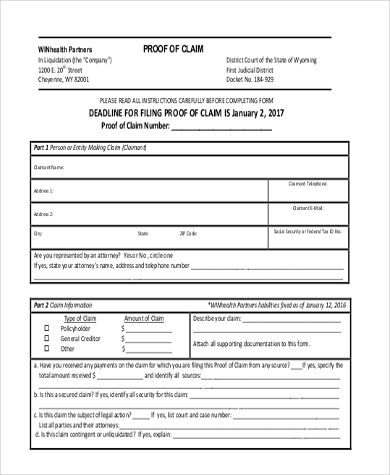 What to Include in Proof of Claim Form? Proof of claim form should include debtor, creditor names and their addresses, claimant mailing address to send notices as well as payments. They should contain court claim number for claim amendments, claim amount, and claim settlement date. In the case of accident settlement claims, the vehicle details that are involved in accidents as well as the date, time and place of the accident should be mentioned. Sales and purchase details and acquisition details should be mentioned as a proof when the claimant is applying for claim and release. They should also be authenticated by the notary public. You may also see Statement of Claim Forms. What are The Benefits of Proof of Claim Forms? There are many varieties of proof of claim form available suitable for various situations and they are available in plenty on the internet. 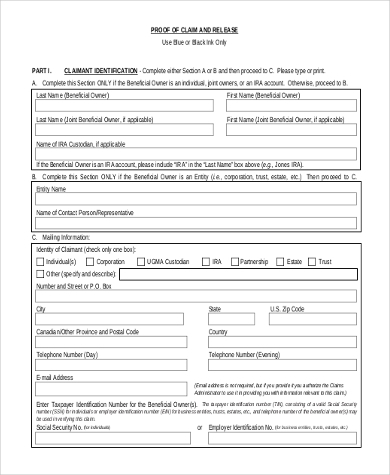 One can download these forms easily which are printer friendly as well as easily modifiable. These forms are extensively used by individuals, customers and companies to claim their settlements. You can also see Quit Claim Deed Forms.